Members of the FAR Lab work on a variety of topics. Often, we are working on more than one project at a time. Here are just a few of the topics that we have conducted research on previously. My project consists on describing and simulating walleye pollock spatial and temporal patterns. Walleye pollock is a fish from the Gadidae family. It has a large role in food webs in the Bering Sea and Gulf of Alaska, and sustains a very large commercial fishery. Although large scale (>100km) distribution patterns are relatively well known from bottom trawl and acoustic surveys, patterns at smaller spatial (and temporal) have not received much attention. Quantifying mesoscale (0.1 - 10 km) patterns is important because many ecological processes, including predator-prey interactions, occur at these scales. Echograms (depth, distance) illustrating some walleye pollock distribution patterns observed in the eastern Bering Sea: well-defined schools, diffuse midwater layer, and benthic 'carpet'. The grid resolution is 0.5 nautical miles horizontal and 25 m vertical. Acoustic surveys are conducted regularly by the Alaska Fishery Science Center (NOAA) to estimate the biomass of walleye pollock. The data collected during these surveys provide a synoptic view of the distribution of pelagic and semi-demersal species at a fairly high resolution (i.e. 20 m horizontal and 0.2 m vertical). 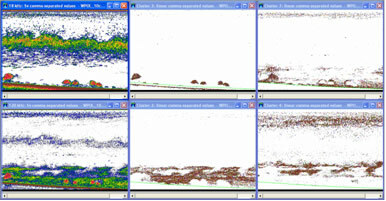 If these data are displayed in echograms, different distributions patterns are evident, including schools, large pelagic shoals and benthic shoals or 'carpets'. I use echo-trace classification and landscape ecology indices to obtain quantitative metrics of spatial pattern and to develop a classification typology for spatial patterns. I also use statistical methods like geostatistics and generalized additive models to explore the relationship among spatial patterns and between pattern and environmental variables. I am also developing an individual based simulation of walleye pollock. In this simulation individual fish behave socially, gathering with other individuals to form aggregations, and reacting to environmental cues (temperature, light, bottom topography and food �patchiness�). 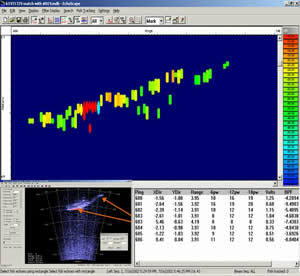 The objective of this simulation is to generate realistic walleye pollock spatial and temporal patterns. This will help us understand how these patterns are generated. In addition, the simulation will generate prey fields to be used as input in marine mammals predation models. Simulated horizontal distributions of walleye pollock obtained with conditional gaussian simulation, using two levels of patchiness. This research has been sponsored by the Alaska Fisheries Science Center. Forage species such as myctophids, bathylagids, and squid are important in apex predator diets in the Bering Sea. Lack of information on nekton species composition, density distribution, and movement reduces our ability to understand the role these species play in the ecosystem. In the Bering Sea, many of these important species are not assessed. This project surveyed nekton in the shelf and slope region of the Bering Sea near Unalaska and Akutan Islands using multiple gear types (acoustics, midwater trawl, MultiNet, LIDAR). Researchers from University of Washington, NOAA, University of Alaska Fairbanks, and Louisiana State University are collaborating on this study. Acoustic analyses from this survey will allow us to characterize nekton spatial and temporal distribution and species composition. Our work will identify strengths and weaknesses of an integrated survey approach. You may also look at a PDF of a poster(4MB) from this project. I am Doojin Hwang and come from Korea, the College of Fisheries and Ocean Science in Yosu National University in Korea. I am a visiting scholar until August 2006 at the University of Washington. Bottom trawl and acoustic surveys were conducted around the south sea of Korea and East China Sea, to investigate distribution of fish and zooplankton. We know that many jellyfish lived in the area and are increasing every summer. It is necessary to know their density distribution, habitats and movement patterns, and to observe changes. We measured in situ target strength of jellyfish in a seawater tank and obtained ex situ target strength data in the ocean. We will now compare empirical measurements and backscatter model predictions of jellyfish target strengths. This research has been sponsored by the Yosu National University, University Visiting Program. I am interested in the time and scale dependent patterns of nekton and plankton abundance. Current methods for evaluation of abundance and dispersion include trawl and acoustic surveys. Due to the slow speed with which an acoustic survey is conducted, typically less than 10 knots, poor estimates of the temporal variation of these animals may result. Ship avoidance behavior of nekton species may also affect abundance estimates. Acoustic surveys typically miss the upper 10 meters of the water column, or less if using a towed-body transducer, which potentially eliminates a significant portion of the biomass depending on species of interest. Incorporating the use of an aircraft mounted Light Distance And Ranging (LIDAR) sampling platform may minimize these limitations and provide key insight into movements of fish schools and plankton over hourly time series. Laser light is used much like sound from a sonar device and can detect the presence and distance of objects in the water. Unlike acoustics, LIDAR is capable of detecting fish and plankton in the surface waters to approximately 20m depth in nearshore (<30 nautical miles) waters. Because the LIDAR instrument is mounted in an aircraft it can survey considerably more area in the same amount of time as ship based surveys, or the same area in a fraction of the time. My research will compare both sampling techniques to characterize the effects of survey speed and transect layout on backscatter (energy reflected from fish and plankton targets) estimates using coincident spatial and temporal surveys. 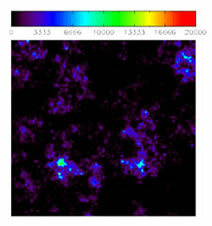 The two figures below are display the change in difference between LIDAR and acoustic backscatter measurements taken at increasingly distant spatial locations (denoted by the colorbar) and temporal lag times, from a coincident (ship and plane measuring the same parcel of water at the same time) location. 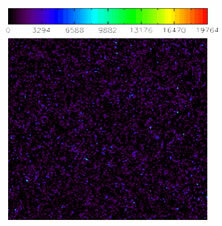 Data is from August 22 � 23, 2005 off the coast of Washington. Note the increasing difference between LIDAR and acoustic backscatter measurements as lag time between coincident location increases from +0.5 - +3.5 hours for August 22. The trend for August 23 is less clear. This research has been sponsored by the National Oceanographic Partnership Program (NOPP). Echogram of tethered Chinook salmon showing multiple echo returns at aspects where fish body width exceeds � pulse width (15 cm). The Alaska Department of Fish and Game (ADF&G) has used split-beam acoustic techniques to estimate adult salmon returns on the Kenai River since 1986. Chinook salmon are of primary management concern, but acoustic counts are confounded during periods when large numbers of smaller sockeye salmon are present. Controlled acoustic measurements of known tethered chinook and sockeye were collected in 2002. Echo data were digitally-sampled and processed to determine if unique acoustic metrics existed that were correlated with salmon species, length or morphology. Individual echo returns from known fish were measured and described using echo envelope width, phase variability, correlation coefficient and fractal dimension descriptors to assess their relative information content, as determined by the percentage of salmon correctly identified as to species. The width and ping-to-ping variability in width of echo returns from chinook salmon were both observed to be significantly greater for chinook salmon than for sockeye. Presumably this was due to the physical width of the chinook exceeding half of the broadcast echo pulse width at certain orientations. Other observed echo characteristics indicative of chinook salmon included greater variability in range between successive ensonifications and multiple echo returns from a single transmitted pulse. Echo envelope width measurements within individual fish were determined to be least variable at the -3 dB power point, closer to peak amplitude than traditionally measured. These attributes will be considered during future annual acoustic assessments of Kenai River salmon passage, with the goal of accurately estimating species-specific (chinook) returns using exclusively acoustic sampling methods. Commercial fishing vessels have long been used as sampling platforms for scientific studies and many national, state, and provincial agencies contract fishing vessels to conduct scientific research to support fisheries management objectives. Echosounders capable of collecting scientific quality acoustic data have recently become available to the commercial fishing industry and researchers around the world have begun to use acoustic data collected from commercial fishing vessels in a broad range of fisheries research applications (Stanley 2000; Dorn et al 2002; Barbeaux et al 2005; O�Driscoll and Macaulay 2005). In the North Pacific the use of scientific quality echosounders by the Alaska pollock (Theragra chalcogramma) fishing fleet has provided an opportunity to collect acoustic data opportunistically during normal fishing operations. Collecting opportunistic acoustic data from commercial fishing vessels allows researchers to inexpensively obtain data from multiple platforms during a single time period. The costs of collecting acoustic data opportunistically is restricted to the price of the digital media used to record the data (~$220 US for 120GB), and the staff time to install and collect media from the vessels. A multiple platform approach potentially offers a more synoptic view of a population than a survey conducted on a single vessel. Although opportunistic data are not collected on a systematic grid and may not be used to obtain population abundance estimates directly, the broad temporal extent and high spatial resolution of the opportunistic data may facilitate investigations on the distribution and behavior of fished aggregations. Due to the unstructured �sampling design� and the multiple platforms from which these data are collected there are significant challenges to its use as a quantitative tool for fisheries managers. The project I am working on will investigate the appropriate use of these data and develop methods for over-coming obstacles intrinsic to this potentially valuable data source. My connection to fisheries acoustics research is through the study of ecological interactions in freshwater pelagic food webs. I�m using acoustics to reveal fish density, distribution and activity throughout the day and season. Mobile downlooking and sidelooking echosounding provide larger-scale distributional patterns, and stationary uplooking sounding provide information about the activity patterns of undisturbed fish. In addition, acoustic tags attached to piscivore fish give information about predator distribution and activity. When combining these data with data from biological sampling, we are able to evaluate models of planktivore foraging and predator avoidance models. Ecological interactions are often highlighted when disturbances to a system changes the equilibrium, such as during a species invasion. Working in a freshwater pelagic community recently disturbed by an invading vendace population, my research is focused on the behavioural interactions between zooplankton, planktivorous fish and piscivorous fish in this system. By combining mechanistic foraging and predator avoidance models, I want to provide tools for simulating realistic individual behavioral decisions. The ultimate goal is to elucidate coexistence/exclusion between competing species, incorporating both predator effects and exploitative competition effects. The location at 69 �N implies a large change in light regime throughout the summer, providing a possibility to distinguish between the effects of light, circadian rhythms, and species interactions. I�m currently staying at the FAR Lab and the University of Washington as a visiting scholar from the University of Troms�, Norway. The data produced by acoustic instruments, such as echosounders, only tell us that sound is being reflected (backscattered) to a greater or lesser extent at particular depths in the water column. The challenge is take this data and extract biologically useful information from it. Traditionally, scientists have relied on a combination of recognizing acoustic features in echograms and then fishing nets through those features to find out what animals are producing them (e.g. in the echograms below we can say with some confidence that the very high intensity patches near the bottom are produced by dense schools of adult walleye pollock). However, this approach only works to distinguish organisms that form distinct features and relies on individual users being able to consistently recognize those features. 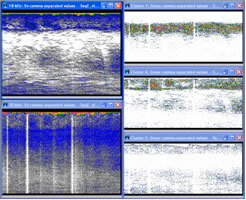 Gulf of Alaska, N. Pacific: Two echograms showing backscatter at different frequencies and four virtual “echograms” showing probability of membership of different classes (warmer colors = higher probability). The upper virtual echograms appear to identify the core of the dense schools of adult walleye pollock and the less tightly packed fish around them respectively, whilst the lower panels separate out other components of the ecosystem. 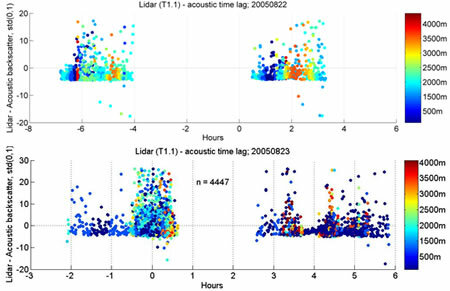 More recently, scientists have exploited the simultaneous collection of acoustic data at more than one frequency to use the most apparent pair-wise differences in the amount of backscatter at the different frequencies to identify specific organisms. My research is focused on taking an unsupervised probabilistic classification technique developed for the analysis of gene expression data (www.seqexpress.com) and adapting it to provide a rigorous method for identifying the different constituents producing the backscatter in multi-frequency echosounder data. This will have applications a) in known systems to provide a rigorous method for extracting the backscatter produced by the species of interest (see above) and b) in unknown systems to provide insights into community structure and composition (see below). Over Mid-Atlantic Ridge, N. Atlantic: Two echograms showing backscatter at different frequencies and three virtual “echograms” showing probability of membership of different classes (warmer colors = higher probability). In this relatively unknown system, the different classes provide clues as to the spatial organization of the community, and so indicate where fishing efforts should be targeted to identify the different constituents.